To most people, it's a wide spot in the road, a place to pass through or at most pull over and take a nap while travelling from Here to There. To those who live there, though, it's the whole world. The formidable Daytona Beech, State Assemblywoman, lives with her son and campaign manager, Hamilton, in a new house fronting Highway 13.5, from which her grandchildren are bussed to the nearest public school, while her daughter-in-law Sandy does the best she can with the days she's got. Homer Land has worked for county law enforcement for some time, while his wife Beulah recently got a job in business. Most of their five children are still in school, but their grown daughter Mary's ready hospitality is well-known even to newcomers. Skye Weiss built his observatory home as far from everyone else as possible, and raised his two green children away from prying eyes. His grown daughter Penny and teen son Woody, however, are happy to welcome newcomers, and have formed close bonds with their neighbors. International sports star Valentine Hart chose to retire to Widespot with his family after his wife Angel's diagnosis with Rodney's Sudden Death Syndrome. He and his children are grateful for the support of their neighbors during the trying time since her death. Successful legitimate businessman Rich Mann and his wife Lana also built their retirement home in Widespot, though he hasn't gotten around to retiring yet. No one's sure what Rich's legitimate business is, but he's obviously done well in it. His son Junior has made quite an impression on the locals. The General Store is the only retail establishment in the area. Somebody put a bench behind some bushes on an undeveloped corner, which local teens call the Makeout Spot. Place the PGWS folder into your game's Neighborhoods folder and load the game. 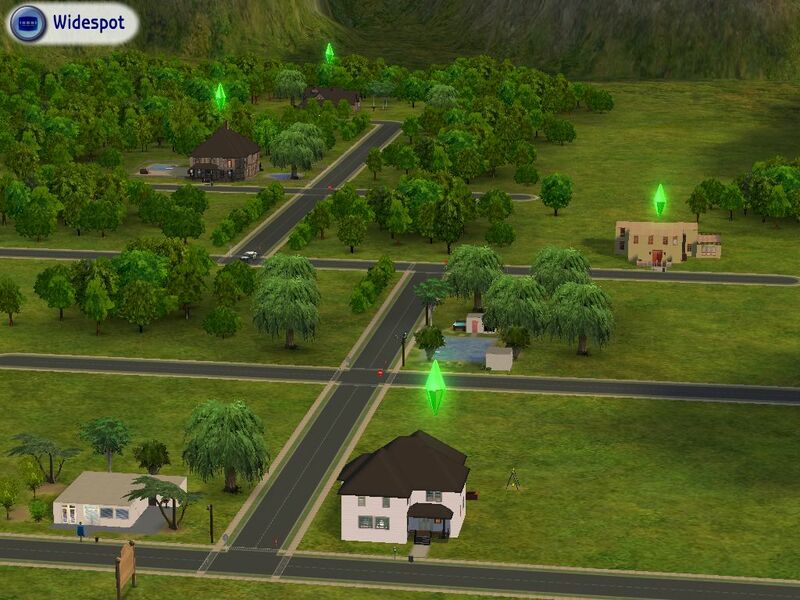 Widespot will appear in the main menu after all your custom neighborhoods with the standard N00~ name protocol. Unless loaded into a base game only installation, the neighborhood will undergo a reset. Gawdawful pun names. Cartoony AKA "ugly" sims. Adultery, unmarried pregnancy, May-December romance, large-nosed alien hybrids, pixelly naked alien and elder hot tub use, mixed-race couples, boys playing with dollhouses, criminal mastermind, difficult or just plain bad moral and personal choices, feisty elders and plenty of 'em. One ghost. One elderly virgin. A couple of playable but architecturally unfortunate houses. No regrets. 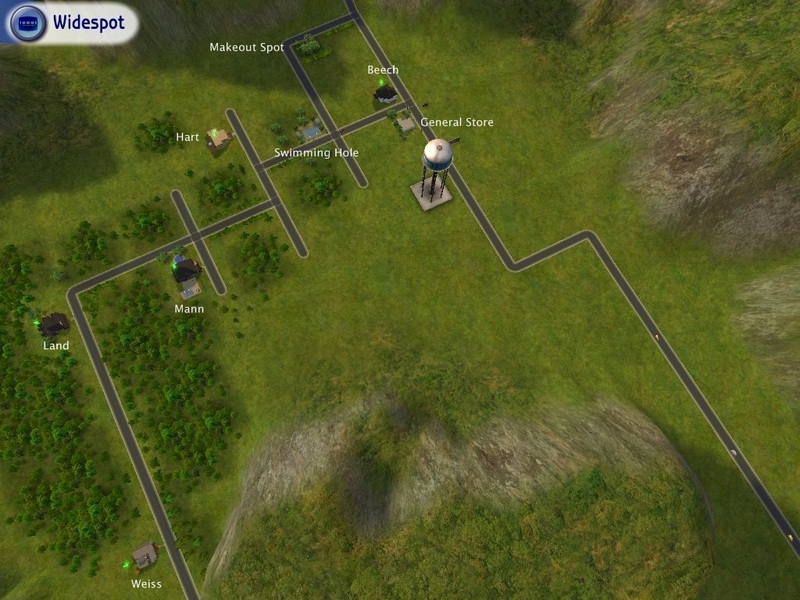 Widespot is a Sims2 base game neighborhood, built on the Sedona map. Built in AnyGameStarter with empty templates, it contains and requires no custom content. When run through Mootilda's Hood Checker, Skye Weiss's abduction memories will be flagged because the PT never spawned during development and "met aliens" therefore points to a sim who does not exist. This should not cause issues during normal gameplay and does not affect subsequent abductions. Widespot will reset when loaded into a game configuration with EPs. Several minor issues arise from this. The largest is that each house's bills will appear in an unpaid heap across the street. Other possible peculiarities include: children generating stars in the first moments of play, a pregnant woman undergoing a superfluous pop that does not affect her pregnancy state, and a fish tank that must be restocked before the sims can feed the fish already visible swimming in it. None of these issues has caused any further complication for anybody in playtest. After playing for awhile, I realized that Woody remembers pottytraining Skye! So I fixed it, and reuploaded it, so my download numbers are suddenly wonky, but whatever. It's an easy fix in SimPE and as far as I know it hasn't created any problems for anyone using the neighborhood. Still, no reason to let a fixable fault like that linger.